Suite for choir, wind orchestra and string orchestra. A work commissioned to mark the35th anniversary of FACE School. 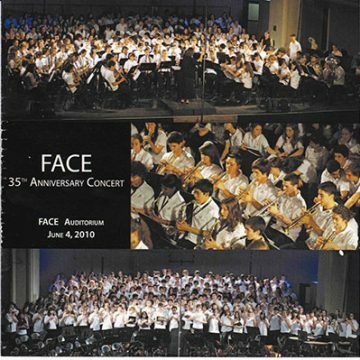 The name of the suite is inspired by a brochure introducing FACE School entitled Le visage de FACE’s Many Faces which I received at the beginning of my year as Composer in Residence. In it we see portrait-like photos that underscore the student body’s broad variety of origins. During my residency I had the opportunity to meet fourth and fifth year students and to experiment with them on ideas concerning contemporary techniques applied to voice, and to share my creative process. But that was not enough for me. I wanted to exchange with these young people in a more direct way, to better understand the ties uniting them and which brought them together in this special school called ‘FACE’. I had the privilege of discussing these things with a small group of a dozen students. A very strong feeling of belonging was communicated during this encounter. And FACE is unique in that the school integrates these students starting in pre-kindergarten and can keep them together through the completion of Secondary 5. It’s not out of the ordinary for a young person to spend eight years or more at FACE. This is no small thing – indeed, it explains the emotional attachment these students feel, and which I observed first hand. Their deep sense of mutual support and respect emerged during our discussion. I came away inspired to compose a piece reflecting these values and aspirations. I also wanted to create music that would transcend daily routine and illustrate the profound feelings of self-discovery and soul searching so much a part of adolescence, that crucial period when we question everything about ourselves, and lifelong values and personality are formed. So I wanted to go further than to simply celebrate the 35th anniversary of FACE. My vision was to create a portrait that could be occasionally funny, sometimes intimate, using music to, in the photographic sense, capture and ‘fix’ the spirit surrounding and defining the school and its student population. I hope I have met my goal. A circus with clowns, tightrope walkers, elephants…and humans? Yes indeed, because the elephants have decided to take control of the show! We rarely have the chance to compose for choir and concert winds. But you could not find a better combination for giving musical life to the festive and playful aspect of the marvellous world of the circus. Following the opening fanfare, the Ringmaster presents the acts. The ring is filled with the antics of the clowns. The crowd roars with laughter. All hearts are suspended as the tightrope artists perform acrobatic feats with grace and feeling. Then the elephants enter and everything changes. The public, delirious and delighted, know beyond a doubt that they about to witness a small animal revolution. From this moment on, it is the elephants who are in control of the proceedings… Since there was still no text available for this composing project and I had to get to work on it without further delay, I went to my files and retrieved this small jewel of a story addressed to the little ones, the very youngest students – who, it must be noted, make up a significant part of the FACE School community. This piece is for them. Le cirque court-circuité is based on a text by Pierre-Jean Cano, for whom I also created the a capella choral composition Coquerelles à l’hôpital. These texts were inspired from working with primary-level kids more than twenty-five years ago in association with the CIBL community radio program Imagine-toi donc. ma p’tite sœur, ma p’tite sœur. ma p’tite sœur est dans maison. The piece then takes a turn toward the embattled heart. And at the very end, after being shattered by the force of strong and troubling emotions, the music wanders along a never-ending beach, tracing a perfectly still sea under a blanket of gleaming stars to a place where it can finally rest and take stock of the road travelled. Couleurs is a reflection of the constant questioning that is part of daily life when we’re sixteen – when the white mixes with the black, and the resulting shades and tints colour the essence of our soul-searching. Nothing is clear. And yet calm and inner peace are never far from our souls, a tiny inch away from hope. This piece is based on a superb text by Kaia Dumoulin focused on that most meaning-filled and distinctive visual aspect of FACE (and especially during a first visit): the stairs. It’s clear that Kaia was inspired when she wrote about the stairways of her school. Her text is poetic, expressing the need to succeed and leave behind a place she loves but which also weighs her down with the slow-moving pace school imposes on the passing of time. Whatever the price, she is determined to win her freedom and take full control of her life. She is ready to take flight, she knows the time is coming soon… I wanted to transpose Kaia’s meditation to a light, airy music. The piano accompaniment adds a spacey atmospheric. When she begins to mount the stairs, the music mimics her movement. Each failed try is mirrored by a music depicting a worn-out spring that has lost its energy. Despite her disappointments, she never abandons the notion of being set free. And out of that motif emerged the idea to create a musical flight of birds heading into the distance at the end of the song… But not just any birds. This is a flight of pigeons, because they are the birds we mostly see within the urban setting – which is the welcoming, solid ground of FACE. We may not see where Kaia’s dream of freedom takes her, but we’re sure she will reach her goal in the end. I wanted to create a piece lending a certain air of decorum to this 35th anniversary. This required a ceremonial colouring – so what better than concert winds to simultaneously express both the rite-of-passage importance and the exuberant energy of this event! This time, rather than a polite role accompanying the choir, it was a question of having the power of musical winds as the driving force. Each instrumental section of the ensemble is called upon to be heard. This is the piece that challenged me most. After a first exposition of the theme, a suspense-filled section with a snare drum ostinato follows. Then a brief canon recalling the opening theme brings us to a full reprise of the theme, now with less force by virtue of its instrumentation, the woodwinds taking centre stage. The return of the brass coveys a feeling of strength that opens the way to a grand finale. Note the colouring free of major thirds in the final chord. That is what gives it the large, expanding tone which, for me, symbolizes the tolerance and the constant opening of spirit I sensed everywhere during my experience at FACE. When I met with a group of twelve students to ask them what they were expecting of me in my role as composer-in-residence, they told me they wanted a sort of official school hymn. And my reaction to that? As they say in English, “Talk about pressure!” At the time, I had already received and chosen the texts with which I was going to compose songs for the choir accompanied by piano. The choice of Après tant d’années met their expectations. The text is a collective work by the students of 11F1. It has all the earmarks of a “gang” song: solidarity, group spirit verging on a family feeling, a show of love without holding on to the years passed at FACE, and recognition of all those who pushed them to achieve. My starting point was a gospel style. I saw an interesting parallel between the origins of gospel and the request for a hymn to the school. In both cases, the music unites a community and is in fact its rallying cry. This is a song that comes from the gut. Its source is the students themselves. Qui vous pré-sente des nu-mé-ros d’a-ni-maux. FOULE : OOOOOOO Comme c’est fin. Sa-cré Bye, bye bye clowns. En rang, en dan-sant, pe-sants. Qui vous pré-sen-te des nu-mé-ros d’êtres hu-mains. FOULE : OOOOOOO Comme c’est beau. The next night, I had a dream I was flying. Sans amour nous ne survivons.